(Bloomberg Opinion) -- As the stalemate over President Donald Trump’s border wall threatens to lead to another government shutdown, all eyes are on the Senate, where a slim majority of lawmakers continues to support the barrier, even though less than 35 percent of Americans do. 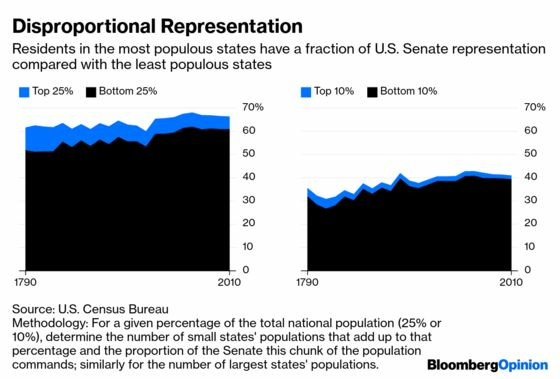 This actually understates the degree to which this system penalized the largest states: The population totals used here include enslaved persons, who counted as 3/5ths of a person in apportionment totals for the House of Representatives. There are 435 seats in the House of Representatives.The apportionment population from the 2010 census was 309,183,463, which yields the figure of 710,767 residents per representative.